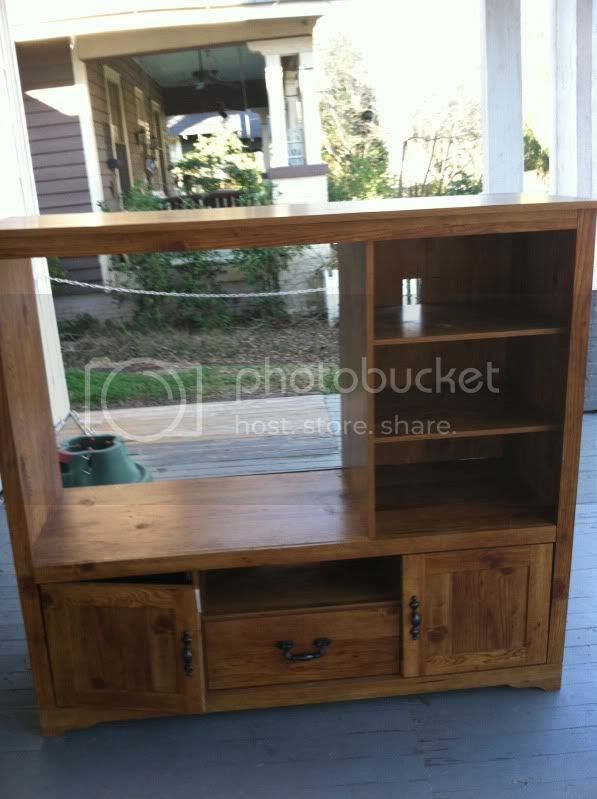 As part of the Impossibilities Challenge, I decided to make over this old TV stand. It was big. It was ugly. But it was also free, and who am I to turn away a freebie with so many possibilities? I was totally inspired by this makeover I found on pinterest. The biggest hurdle to overcome once I decided to start was dealing with Punky Brewster's paint choices. It was very retro. 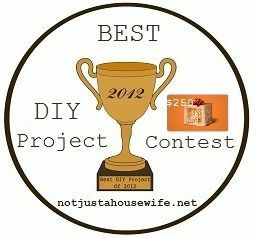 I also wanted to add, the biggest expense on this project was the $6 I spent on fabric. Everything else, including the paint, were leftovers from other projects! The drawer pulls are Mary Engelberit, I believe. 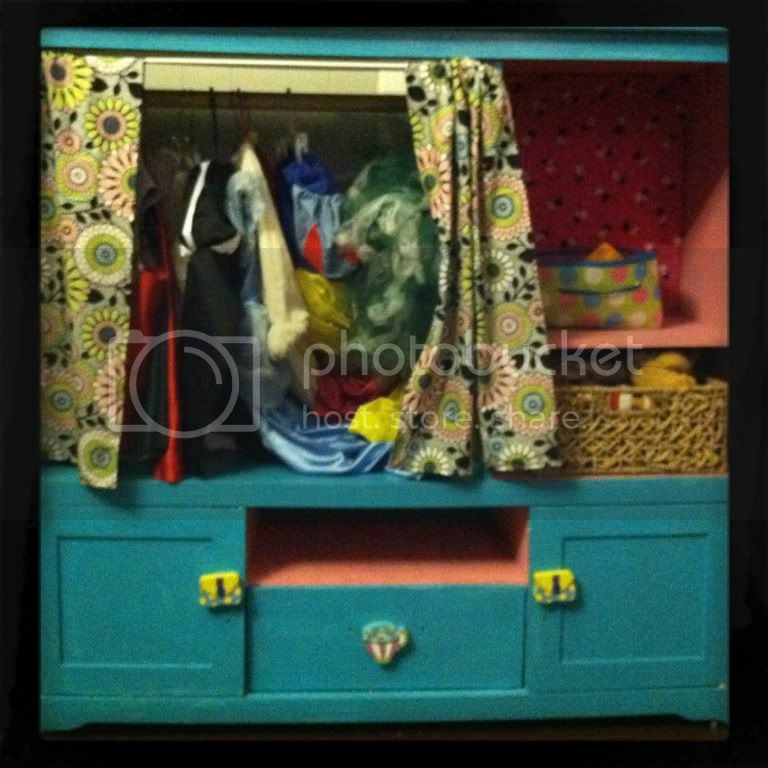 I found them several years ago at a charity rummage sale and they were used on another dresser, but they didn't work with the dresser once we redid the girls' room. So they went back in the "use later" pile. And what's behind the curtains? 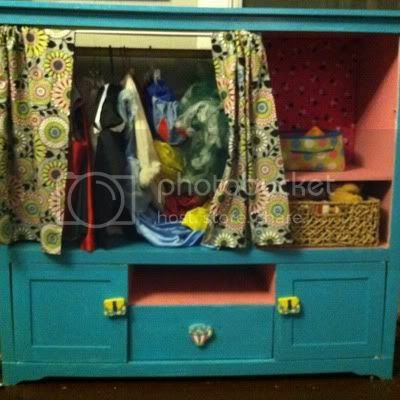 This is a carefully disguised dress up play station for the little girls. We hung all their dress up gear, including the tutus, behind the curtains. In the spotted basket (found at DollarTree) are the fun hats and tiaras. Inside the wicker basket are puppets. The plan is to put furniture moving disks under the stand. If the girls want to pull down all the clothes (something I know is going to happen frequently! ), they can push out the stand and perform puppet shows. Behind each of the doors, we also have other fun creative play items including play dough, coloring supplies and a few games. And what dress up station is complete without a mirror? I'm just loving each and every part of it! The girls must be so thrilled ... I love that they will have their very own puppet playhouse. I so wish I had something like that growing up. And the dress up area and mirror. Perfect, perfect, perfect. How fun! You have been such a source of inspiration and encouragement for me this month. Thanks so much for joining in! 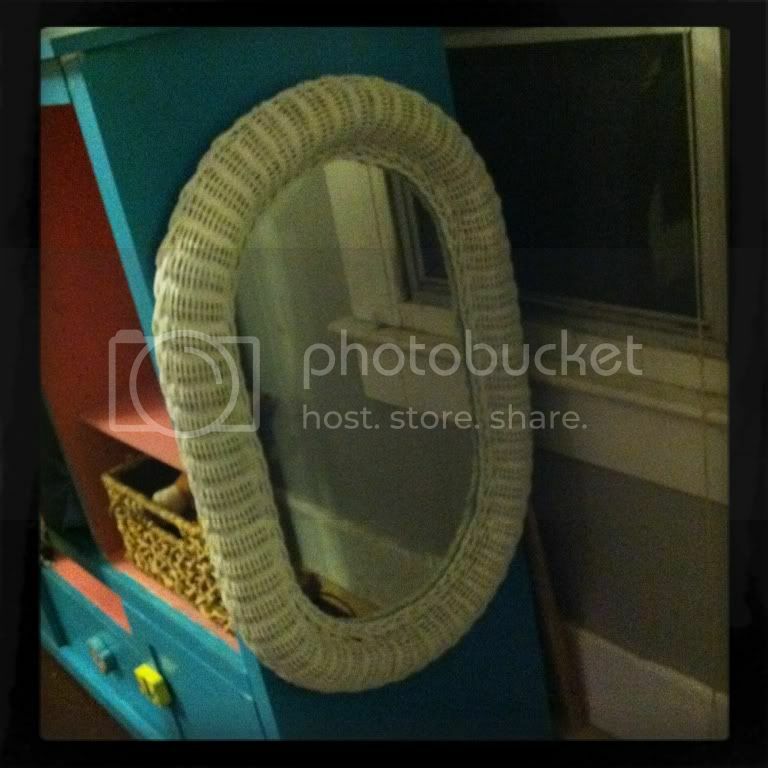 Why not paint the mirror the same colour as the inside of the unit...it looks like a salmony peach. Then it would co ordinate with the unit. As for the mirror?? I vote for black! Again great job, wish I'd have thought of this for my dd a few years back. Way to go! This looks great and turned trash into treasure! I think you should paint the mirror to update it. Oh, I would have loved to have this as a kid. What an awesome transformation!! So many fun details, I bet the girls spend a lot of time checking themselves out in the mirror. :) So fun!! 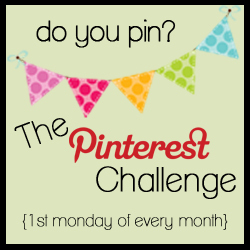 Thank you so much for linking up to the challenge! I love the dress up area! I like the mirror white, but I would also think it would be cute painted the same color as the inside! The color is great! This is great I can't believe it is the same thing just with some TLC. Love this - such a fun little puppet house - for $6 too! 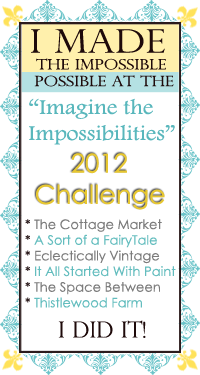 Thanks for joining our Impossibilities Challenge. Thanks for linking up for all to see and love! It looks great but I'd be worried about it falling over and injuring one of the little ones if they could push it around... I read we should anchor these heavier bulky items to the wall? Hi Micki, your dress up station is adorable! I'll be featuring it this evening at Project Queen's Highlight Party #19. Thank you so much for sharing it with us! I would have loved something like this as a kid! I like the mirror on the side. I, too, wondered about painting it the same as the inside, but what do I know? I can't even decorate me house! Thanks for linking this one as well to Pin-ed it, Made it. This did turn out great! 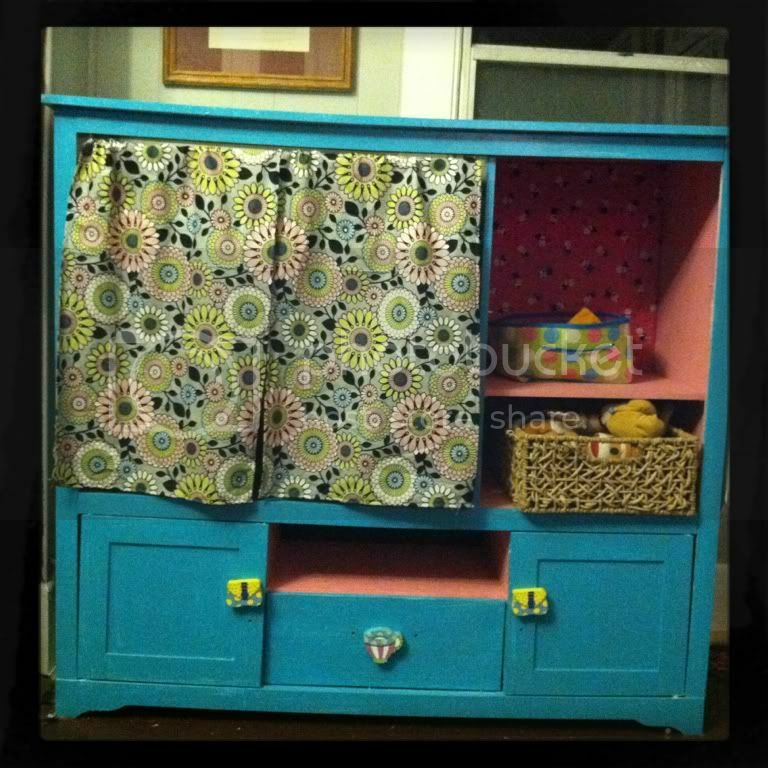 I have been collecting dress up clothes for my little girls, and would love something like this to keep it in. I love the name of your blog. I feel that description definitely fits me most of the time.